As the city recovers from a violent earthquake, Sanaa is left to deal with her fate. 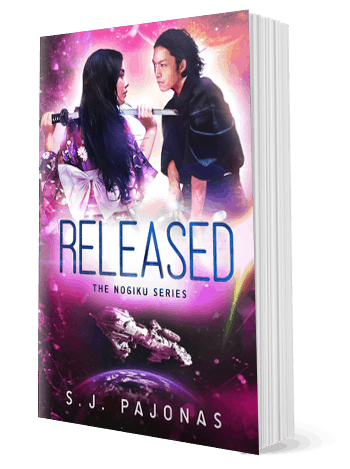 Released is the second installment in the Nogiku Series, a saga of post-apocalyptic sci-fi novels set in future Japan. What a supremely cunning liar Minamoto is. I’m sure he knows everything about the fight, my injuries, my recovery, and my near death again in the hospital at the hands of an assassin. He has spies. We have spies. If only we all just told each other everything, but instead we do this dance. To men like Minamoto, the dance is everything, and if I don’t want to offend him, I will have to step lightly. “I am quite well now, thank you, Minamoto-san.” I rise from seiza to lean forward and lift my cup of tea from the table between us. Jiro is sitting silently to my left, Usagi standing behind me, and Sakai is on my right. I sit back on my heels and take the time to sum up Kentaro Minamoto. He’s twenty-two, the same age as Jiro. He’s lean, fit, and possibly a little wiry under his gray kimono. He has a thin face, long forehead, and short spiky hair. If I had seen him out and about, I definitely would have thought, “Not my type.” He has yet to utter a word, but he is watching me while I watch him. “Minamoto-san, you said you had business to discuss,” Sakai says, setting his tea cup down and placing his hands on his upper thighs. I continue to sip at the genmaicha. Hmmm, this tea is not as bad as I remember it being. Kentaro lightly shakes his head at Minamoto. Violences flashes over Minamoto’s eyes as Kentaro turns towards me. I keep my face as passive as possible. Here it comes.